Enrique Iglesias was not consulted on the making of this game. Because naming a game Hero would be considered boring and a waste of everyone’s time, Activision named their game H.E.R.O. cause that’s what good companies do when they’re trying to get people intrigued. Everyone’s like, “Hmm, what does H.E.R.O. stand for? I bet it means something awesome and related to the game. Like, the main guy is a hero, but he’s also a H.E.R.O., ya know?” Then you find out the hero’s name is Roderick Hero who’s on a H.E.R.O. – Helicopter Rescue Emergency Operation – then Xzibit is summoned because you said “hero” a certain number of times in a row. All part of Activision’s diabolical plan. In H.E.R.O., you guide Mr. Hero down an about-to-burst volcano to rescue miners. 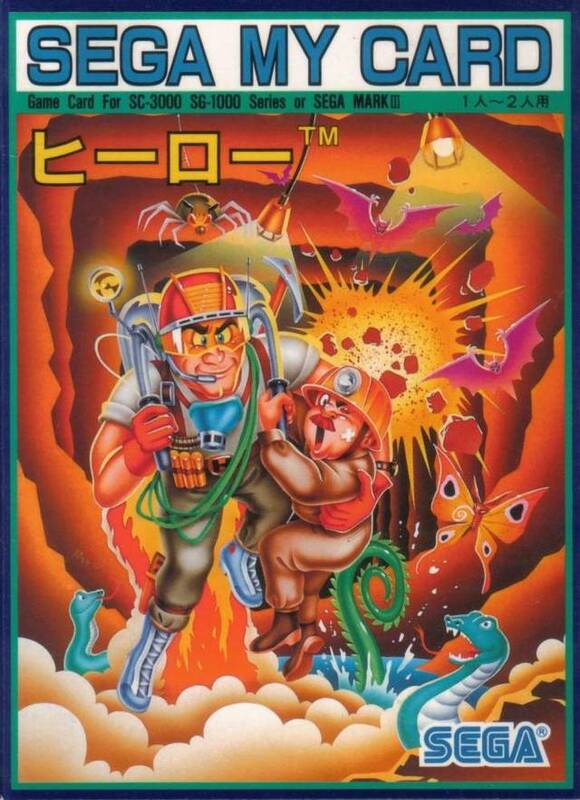 The miners are trapped in the center of the volcano, which takes some time to reach, don’tcha know. Before you get to them, you work your way through a number of adult situations: bats, moths, snakes, lava, both vertically dribbling and in horizontal pools. 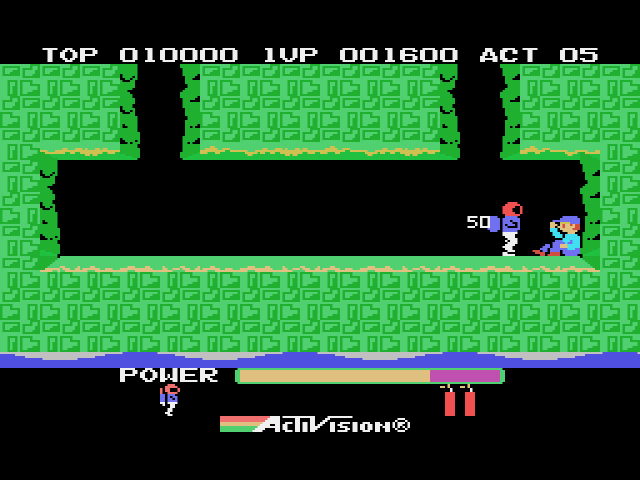 These situations are totes doable because Roderick is equipped with a jetpack, (only in the SG-1000 version, which I guess should technically be called J.E.R.O. ), a laser gun, and a certain amount of dynamite, depending on the level. The dynamite should be used for walls only, and- hey, don’t stand so close to it unless you want to die. The laser gun is for the wee enemies who would have been killed by the encroaching lava anyway, so no harm, no foul. The first five levels are so easy, you’ll question why Activision bothered producing this bizarre concept into a full-fledged game. Once H.E.R.O. hits stage six, though, this hero business gets raw and the whole rescue operation may as well be soundtracked by Nine Inch Nails’ “The Downward Spiral” (cause Roderick Hero’s going down in the volcano physically and in his spirit emotionally, plus yo dawg, I heard he likes to get down). Because your progression moves you constantly downwards and the screens don’t scroll to provide you a glimpse of what’s on the following screen, you will never see danger in time to avoid it. Fall down a hole and land in lava or atop a floating bat, and woops, you’re dead! But you should have known to swerve just a hair to the right in order to avoid the enemy cause you’re a hero and good heroes are psychic, yeah? And the hit detection, Lord have mercy. Sometimes a dynamite blast kills you, sometimes it doesn’t. I’ve died by “touching” lava in the game, despite the fact that my main character sprite was nowhere near the lava. Finally, the jetpack, which only works when you’re jamming ‘Up’ and Button II together. Surely, pressing ‘Up’ twice would have been more helpful than having a necessary item only operate when it feels like it? That’s lava, by the way. And yeah, Roderick’s walking on air, even though the jetpack isn’t on. By level 12 or so, H.E.R.O.‘s straightforward boring levels become mini-labyrinths, full of branching pathways and wrong turns. 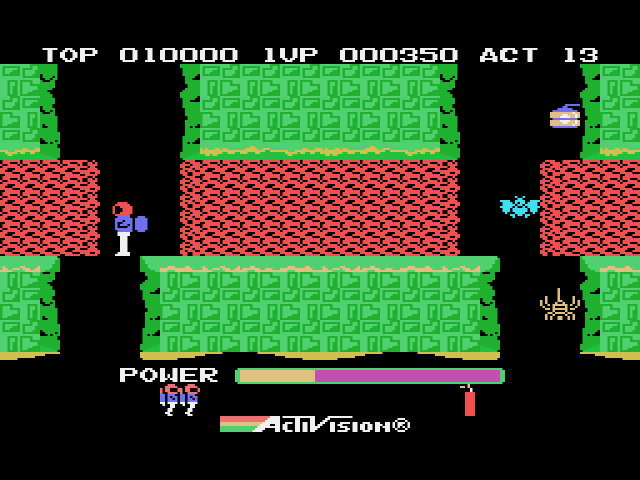 As you make your way through these areas, you see a power bar that you’ve never noticed before at the bottom of the screen. It’s constantly decreasing and there’s nothing you can do to stop it. Run out of power, run out of life. Is this a bad thing? Nah, it just means you’ll have to blaze through the volcano faster than Snoop Dogg through a spliff. H.E.R.O. plays well enough if you’re willing to give it a chance, but Xzibit help me, I didn’t care for the game at all. Even as the levels expanded and H.E.R.O. turned from a fast-paced arcade game into a slightly non-linear platformer, the game feels one-note. Falling down chasms time and time again is necessary to the idea of venturing downwards into a volcano, but it’s not like you’re falling to complete creative objectives or distinct puzzles. Kill a moth, fall down, blow up a wall, fall down, and so the ballet of heroism goes. Plus, the flaws: poor hit detection, cheap deaths, obnoxious trial-and-error gameplay that’s tacked on to extend the length of the game. Roderick Hero might be a hero from H.E.R.O, but he’s not my hero. Question: Would you ever consider doing let’s plays for some of the games later on? If the demand was high enough, I would definitely look into it. Judging by the podcasts, I think it would be really fun and interesting to listen to. Maybe for some Genesis games? Perhaps for some European and Japanese games that don’t get much coverage. Hmm… you have given me something to ponder. H.E.R.O. helped define a genre? Really? I mean, I believe you cause you’re a reliable source of info. I’m just surprised. Granted most of what I know comes from this article. And a few other mentions over the years. I know this game was on a lot of different systems. Oh wow, I missed this article. Thanks! Man, I forgot about this one. We also had this for the Apple II, although this was a cracked copy. Too much trial and error for my liking at the time. I’d probably draw a map and dig it now. If I could thrice like this, I totes would. S-rank review of a D-rank game.